CranioSacral Therapy (CST) is a gentle yet powerful technique that is effective in releasing neck pain, back pain, and mental stress (among many other things). It does this by optimizing the movement of cerebrospinal fluid through the spine and around the skull. Developed by physicians William Sutherland, and John Upledger this therapy provides a very soothing and relaxing healing experience. 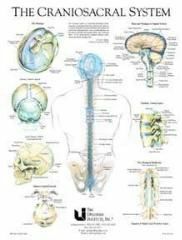 The craniosacral system is a functioning physiological system composed of cerebrospinal fluid, the membranes that contain it, its osseous attachments, and the mechanisms that produce and reabsorb the cerebrospinal fluid. It has a powerful influence over the nervous, endocrine and immune systems, and a total-body effect. It is also characterized by a palpable, rhythmic, mobile activity that persists throughout life and continues on 20 min after the heart beat stops. I completed the Upledger Institute Core Pack program; furthering my education in this amazing field. I have completed the CranioSacral Therapy 1 & 2, and the Somoto Emotional Release 1 & 2. Qualified Teachers Assistant; Madison WI 1 16-19 2014, & Chicago IL 6 5-8 2014. This is by far the most valuable massage technique I have worked with! Request your session today to experience the many benefits of CranioSacral Therapy / CST. 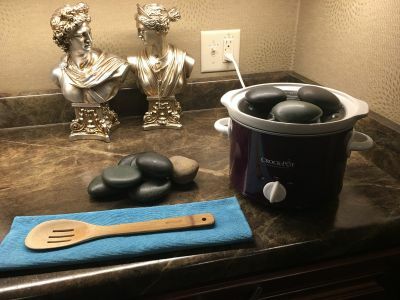 HOT STONE THERAPY / As mentioned, these are part of every massage no extra cost! In this style of massage: heated stones are used moving on your body to deepen relaxation and promote circulation in your muscles. Muscles that are heated with these stones release tension and stress much deeper and quicker. I then work even deeper on your knots and stressed muscles, without creating resistance or tension. 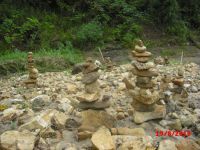 Ask is f you prefer stones to be left in hands or set on knotted area, otherwise they are not left in one place. The overall experience is very relaxing, nurturing, & healing. Therapeutic Massage is designed for your specefic concerns at the moment. A theraputic massage will consist of many skills combined to get the results you expect. Pain management is also part of the treatment. The pain scale of 1 - 10 being used (1 very little pain to a 10 having to get medical treatment). Your pain will be decrease. Let me show you how a great massage can change everything. Call now to book your session and let me handcraft a massage just for you. Michael Morgan (My instructor; CST 1 / Upledger Institute) created and teaches CSTLRAP. 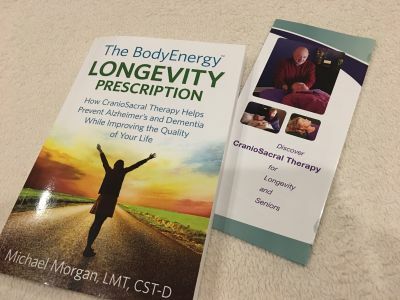 Morgan wrote a book: The Body Energy - Longevity Prescription - How CranioSacral Therapy Helps Prevent Alzheimer's and Dementia While Improving the Quality of Your Life. ISBN-13: 978-0-578-14820-5 $17.95. Morgan also made and sells a DVD. I attended this special 4 day class in Highland Ridge Co. August 2014. Plus a refresher again in Minneapolis MN August 2016. You remain fully dressed for this session. Light hands on therapy. No oils are used. Advanced CranioSacral skills are used. The back of Neck will be massaged gently but deep, ensuring muscles return to their full range of motion and resulting pain free. Many results are immediate and very empowering. These techniques are actually incorporated into every session to help you age gracefully and keep you in balance, but selecting CSTLRAP provides a deeper concentration on specific areas which brings about vast results. Somoto Emotional Release delves deeper than CranioSacral Therapy (used together in your session) into the Emotional concerns that create and manifest physical ailments.The client remains fully clothed and covered on the warm massage table. The therapist guides client into safe dialog accessing deeper emotional issues needing to be released in a gentle way. The therapist monitors body responses and progress till endpoint. Multipul concerns may be addressed in one session. Even birthing traumas may be addressed to release one from deep underlying matters. Pain management and a feeling of a weight lifted off your shoulders usually result from this therapy. Reflexology is a type of bodywork that focuses on applying pressure to the specific nerve zones in your feet, hands, and ears. Reflexology is an in-depth science that aims to harmonize your entire body. 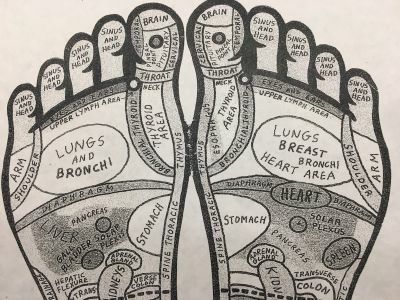 According to reflexology, every part of the human body is mapped into your feet, hands and ears. Reflexology treatments have been found to be highly effective for conditions such as allergies, headaches, and depression. I am always learning more to help ease your discomforts quicker and most effectively. Energy work is based on the belief that everyone has a "life force", and that the body needs to sustain its balance for optimum health. I call this the divine. Anytime you experience emotional or physical illness, it indicates that your life force has simply become unbalanced. I work directly with your energy field to restore balance and flow to your entire system. And once your energy field has been restored to full health, your body will follow. Myofascial massage differs from other types of massage in that it targets the fascia (the membrane surrounding muscles) rather than the muscle itself. Since fascia completely encases every muscle in the body, imbalances in the fascia can have serious effects on your range of motion and comfort level. 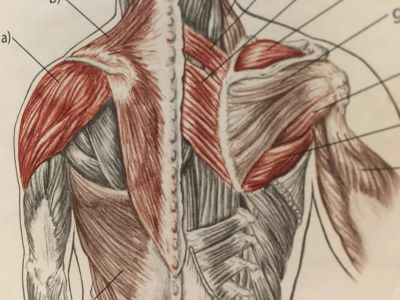 While other forms of massage can overlook the fascia, myofascial massage focuses specifically on releasing tension in this important membrane.